I admit it. I sometimes thought my sister Arlene was a bit crazy for trying to start a non-profit organization all by herself to help people with such great needs on the other side of the globe. The Sherbro Foundation’s first round of scholarship awards to young women in Rotifunk’s four secondary schools is the latest point of pride. 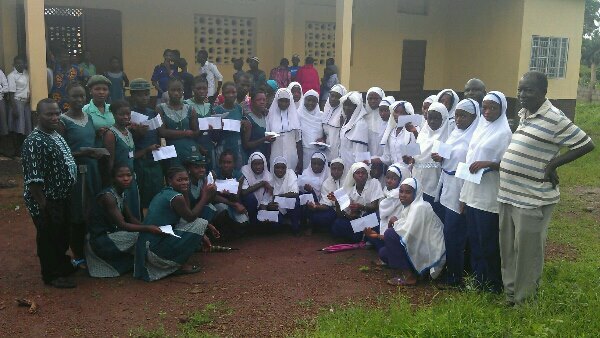 First, it’s amazing that Prosperity Girls High School, a four-year-old school, achieved an impressive feat last fall when 100% of their students who took the West African standardized senior high entrance exam passed it – a feat for which they received special recognition from the national Ministry of Education for exceptional results! Each girl passed on her first try AND the school had complete success on its first time sending girls for the exam. It’s amazing that an impoverished rural community created its first all-girls secondary school. It’s amazing that Rotifunk’s new nonprofit, the Center for Community Empowerment and Transformation, voluntarily formed by teachers at the new Prosperity Girls High School, is administering the scholarship program as a foundation partner. It’s amazing that 138 girls benefited from this year’s scholarship program ranging from 7th to 10th grades. So it was time to celebrate. To read Teacher Osman Kamara’s account of the recent scholarship presentation ceremony for the young women is heart-warming. It would convince anyone that the Foundation must keep growing. “The activities of Sherbro Foundation have become visible and the people of Bumpeh Chiefdom are hopeful and have the belief that their lives (are improving) and the burden of their children’s education has been lessened with the involvement of Sherbro Foundation,” he said. The celebration was attended by 200 parents and guardians and many community leaders of Moyamba District. Master of Ceremonies S.P. Gibril pointed out that it was the first time in the history of the District that so many female students in all the secondary schools of Bumpeh Chiefdom received scholarships. He also thanked Paramount Chief Charles Caulker for connecting Arlene with the community. Chief Caulker and Arlene were fellow teachers more than 35 years ago, when she was a Peace Corps volunteer in Rotifunk. Home visits were required in most cases, in order to verify economic status and school enrollment. In a remarkable approach to trimming red tape and ever-present bureaucracy, parents were directly awarded the scholarship money. This was done because this first round of scholarships was awarded for the just-completed 2012-2013 school year. Most of the parents and guardians anxiously awaited the funds because either they could not afford to pay the school fees, or had taken loans for which they still owed. The nation’s Education Ministry for Moyamba District was also represented at the scholarship event. Abdul Karim Kanu, who is the Moyamba District Inspector of Schools, commended the Sherbro Foundation. He promised to report the CCET’s successes to the Education Ministry in the capital of Freetown. The foundation’s partner on the ground has the potential to become a model for the country. Thank you! I do work hard to provide quality info. It’s all based on my own trips to Sierra Leone and my experiences in Bumpeh Chiefdom. The projects and information you read about come from my own work with Sherbro Foundation. I’m so glad you’ve found it worthwhile. I’m a woman, by the way. You can read about how I got involved in Sierra Leone under About Us. Thanks. 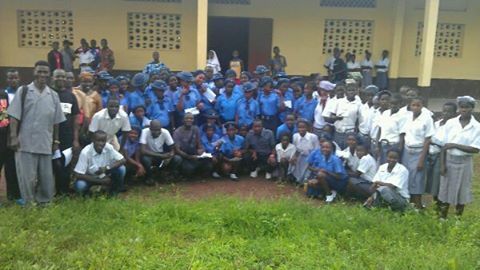 Sierra Leone School Girls Are Safe!